Yes, we're getting a little personal today, but this is so important. October is here, so yes, we're talking about breast health today. It is Breast Cancer Awareness Month, so this is the perfect time to be talking about it. According to the National Breast Cancer Foundation, one in eight women in the United States will be diagnosed with breast cancer and breast cancer is the most commonly diagnosed cancer in women. It is also the second leading cause of cancer death among women and every two minutes a woman is diagnosed with breast cancer and one woman will die of breast cancer ever 13 minutes. There are also over 3.3 million breast cancer survivors in the United States today. Those fast facts aren't meant to be taken lightly. I have loved ones who have been affected by breast cancer. My great aunt passed away a few years ago because of it. I'm sure you have probably been affected by cancer of some sort in your life, too. When it comes to breast cancer, prevention and early detection is so important. 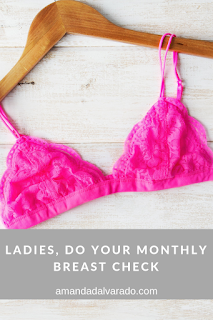 This is why your monthly breast self-exam must be a part of your routine and lifestyle. It doesn't take long and isn't even uncomfortable. Taking a few minutes once a month to examine yourself could save your life. Remember, a breast self-exam shouldn't replace your mammograms. If it has been recommended to you that you start getting them, just do it. I know that as women, our medical procedures aren't without discomfort and sometimes pain, and I really hope that people are working on making things a little more comfortable for us, but despite dreading certain procedures and appointments, we need to make our health a priority. This is coming from someone who absolutely dreads any time of doctor appointment. I'll be bold and say that I hate going to a doctor. I have a calendar reminder on my phone that reminds me the same day every month to do my breast self-exam. Here's how I do it and it might be a little TMI, but this is important, ladies. In the shower, I'll take my fingers and move in a circular pattern, checking the entire breast and armpit (don't forget this!) from the outside to the center. You're checking for any lumps, thickening, or knots. Then, I'll get in front of a mirror and just look with my arms down and then I'll raise my arms checking for any changes in contour, swelling, dimpling of the skin, or other visual changes. Also, I'll rest my palms my hips and press to flex my chest muscles just to see if there are any other abnormal changes. The last thing I'll do is lie down and check like I did in the shower. Once you start doing this, it will be just part of your routine and it will help you understand what is normal for you. If you notice anything that concerns you or that you haven't noticed before, talk to your doctor. Check the ladies every month and remember, if something doesn't seem normal, just talk to your doctor. It may be nothing, but peace of mind is important and it is better to be safe than sorry. That's the phrase, right? Start your monthly self-exam today and then set a reminder on your phone!